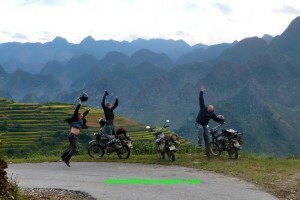 This is one of our best short motorbike tours in Vietnam from Hanoi. We design this tour for people who don’t have much time in Vietnam but still want to see the real Vietnam with local hill tribes, scenic mountain passes, rural villages…. The tour is a good combination of light adventure and the hidden Vietnamese culture discovery. Day 1: Hanoi Motorbike Tour to Phu Yen. – 160 km. Start this special motorbike tour in northern Vietnam with a short ride to Phu Yen. We start our motorbike ride from the western outskirt of Hanoi, strive to be on a quiet and small road as long as possible to get away from busy traffic. After 2 hour riding, we will be right in mountain area with countryside roads between green rice and tea fields . Lunch is in little town Thu Cuc after passing small corner of Ba Vi National Park. We arrive Phu Yen town at about 4.30 PM. Get the room and enjoy a short walk around peaceful town . Stay overnight in Hotel – Phu Yen. Day 2: Phu Yen – Mai Chau. – 150 km. After breakfast in the hotel, we will have another short and enjoyable motorbike tour in the mountain area of Vietnam. Right after the town, we will motorcycle along the Da river on the winding road until the Da River Pier. Put all the bikes on the ferry and start the great ride in another side of the river. We will go all the way up from 300 meters to 1000 meters above sea level. This northern Vietnam motorbike tour offers you plenty of breathtaking mountain views. We will stop in Moc Chau plateau for lunch. After that we will enjoy a great Vietnam motorbike tour on the forgotten French road built in the 1920s. the road shows us plenty of picturesque views and offers us a lot of chance to visit the colorful and happy ethnic people. We will get to Mai Chau at about 4 PM, and spend the rest time of the day to walk around the villages of the white Thai people who live in the houses on stilts, or walk on the rice field to see the life of the local and learn how to plant or harvest the rice. Stay overnight in Mai Chau – Home stay. Day 3: Motorbike tour back to Hanoi. Option 1: Motorbike tour on the old French road along the Da river- 190 km. We will go back to the road No 6 and take a turn to small and less traveled French road that leads us going along the Black river lake. The view here is like in Ha long bay. This is a good motorbike tour back to Hanoi that we strongly recommend. Option 2: Motorbike tour on Ho Chi Minh trail back to Hanoi – 240 km. 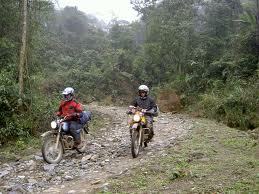 Vietnam Motorbike Tour Expert suggests you to take the option 2 if you are experienced motorbike riders. There are more interests on this road, especially you will have chance to have great motorbike tour on Ho Chi Minh trail. However, it is longer and busier road. We will count the time to be in Hanoi before rush hours and finish the short but best northern Vietnam motorbike tour safely.